You probably have met people who feel that they would rather not know anything about health food and what exactly they are eating because ignorance is bliss and nothing is more important than enjoying what they eat. But possessing the right knowledge can be powerful; it can drive us to find out and understand what healthy eating is all about, why some people become so interested in health food, and what triggers and convicts people to want to change their lifestyle. Knowing what is good or bad to eat helps you plan your diet more wisely and safeguard what is most important, your health. Here, I have put together four most talked about topics in healthy eating and health food: Fats, Meat, Fiber, and Sugar. If you never know these facts before, perhaps they would change your whole perspective about eating right. Meat may not exactly be called a health food but it provides us many micronutrients such as vitamin B12, calcium, and vitamin that a growing body needs and is a major source of protein, for instance, beef contains highly absorbable trace minerals like iron, zinc, and manganese. Poultry and seafood contribute vitamin B6, and pork is a rich source of thiamine. However, meat and poultry contain quite a bit of fat, and about one-third of that fat is saturated. Saturated fatty acid in the diet has been shown to be positively correlated with total blood cholesterol levels, cholesterol levels, and negatively correlated with (beneficial) HDL cholesterol levels. Saturated fat intake is at least as closely related to arterial clotting. A high intake of animal fat may increase the risk of a number of cancers, including cancer of the colon, breast, prostate and pancreas. Eating grilled or barbecued meat, or seafood also exposes us to carcinogens called heterocyclic amines (HCAs). 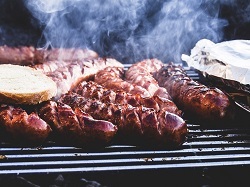 These health hazardous substances form on foods as they cook on open flame or under the high heat of the grill, regardless of whether or not char is formed. Also, it's interesting to note that when fat drips onto the heat source, it creates flare-ups and smoke which then deposits on the food yet another group of carcinogens, called polycyclic aromatic hydrocarbons (PAHs). Tip on how to enjoy carcinogenic-free grilled meat: One way to avoid these carcinogens and still enjoy grilled meats as health food is to put them under foil wraps before putting them on the fire. In addition, the food gets the aroma of grill, especially if you leave the top loosely sealed. Baking and roasting are healthier cooking methods. They are less likely to produce HCAs as the cooking temperature is lower, and cooking with liquid (boiling, steaming, poaching, stewing, etc) generates no HCAs. Dietary fiber is found in plant foods, namely cereals, beans, peas, wheat, fruits and vegetables, and is the magic ingredient which helps maintains our digestive system in perfect shape. It's made up of the indigestible parts or compounds of the plant that pass relatively unchanged through our stomach and intestines, although bacteria in the large intestine can partly digest fiber through fermentation. Fiber slows down the rate of digestion of food, leading to a more gradual emptying of the food from the stomach into the small intestine. This basically means food gets digested sooner, and the indigestible bits, including the fiber, are moved out faster. Healthy digestion contributes to lower weight and increased health, which means less risk of getting many of the modern diseases such as colon disease and even diabetes. By slowing stomach emptying, fiber helps avoid the situation where the body has to produce large quantities of insulin (as a result of repeated rapid release of glucose into the intestine). This in turn helps protect against diabetes. A high fiber diet is even more important for older people as our digestive system slows down with age. Fiber is also known to absorb water to become lighter, bulkier and easier to move along. This is why it helps prevent constipation. When it absorbs water in the stomach, it gives that feeling of fullness and therefore lessening the amount of food consumed. Thus, don't forget to drink plenty of water throughout the day, so that the fiber you eat can swell to be as light as possible. The key in getting health food is substituting good fats for bad fats. Saturated fats are found in animal products like meat, seafood, whole-milk dairy products (cheese, milk, and ice cream), poultry skin, and egg yolks and dairy. Some plant foods are also high in saturated fats, including coconut and coconut oil, palm oil, and palm kernel oil. Saturated fats raise total blood cholesterol levels more than dietary cholesterol because they tend to boost both good HDL and bad LDL cholesterol. Trans-fats are found in commercially prepared baked goods, margarines, snack foods, fried snack foods like French fries and onion rings, processed foods, and margarine; many of them are produced by heating liquid vegetable oils in the presence of hydrogen. This process is known as hydrogenation. The more hydrogenated an oil is, the harder it will be at room temperature. For example, soft margarine is less hydrogenated and so has fewer trans fats than a stick margarine. Trans fats are even worse for cholesterol levels than saturated fats because they raise bad LDL and lower good HDL. Good sources of healthy unsaturated fats are found in health food products derived from plant sources and fatty fish such as salmon. The two main categories are polyunsaturated fats found in high concentrations in sunflower, corn, and soybean oils and monounsaturated fats, which are found in high concentrations in canola, peanut, and Mediterranean diet's favourite - olive oils. These healthy fats not only improve cholesterol levels but also protect the heart. Almost every food we eat contains sugar. It's better to enjoy a really extravagant dessert once in a while than to fill your daily diet with "fat-free" sugary treats which are basically empty calories and devoid of nutritional benefits. Other than table sugar, watch out for other forms of sugar, especially those words ending with "ol" or "ose". Consuming sugarless artificial sweeteners in so called health food may be more damaging than helpful to our health. In order to keep the amount of sugar floating through your blood vessels at around a teaspoon, your body releases insulin whenever you eat foods that result in sugar entering your blood stream. Most carbohydrates fit this category. Sugar, most sweeteners, grains, cookies, soft drinks, pastries, cakes, pasta, and starchy vegetables like potatoes all lead to a release of sugar into your blood stream. Insulin works by stimulating your cells to sponge up this excess sugar out of your blood stream. Once inside your cells, sugar is used for energy, with any excess amount being converted to fat tissue. Excess insulin is known to cause weight gain due to storage of fat and sodium retention which leads to holding excess water and high blood pressure. Reduce your intake of sugar and all foods that contain sugar. Some of the most concentrated sources of sugar are soda, cookies, chocolate bars, donuts, pastries, ice cream, and ketchup. Avoid sweeteners like molasses, corn syrup, high fructose corn syrup, and maple syrup, and replace table sugar (be it white sugar or brown sugar) in your beverage, cooking and baking with natural sweeteners such as honey. Do activities and exercises that build or maintain your muscles. Muscle tissue acts as a storage site for extra sugar. The more muscle tissue you have, the better you can regulate your blood sugar and insulin levels. End of "4 Health Food Tips to Eat Well". Back to "Start Your Weight Loss Diet Today!"